Not all sushi recipes use raw seafood, and this dish calls for cooked shrimp. This is a great beginner sushi for kids and those not interested in eating raw fish. Bring a large pot of salted water to a boil. Skewer the shrimp from head to tail with toothpicks. Add skewered shrimp to boiling water and cook 3 minutes; transfer to bowl of ice water to stop cooking. When cooled, remove the shell and skewers from shrimp. Make a slit in the underside of the shrimp and cut through almost to the top but not completely. Remove the dark vein. Moisten your hands with a mixture of cold water and vinegar. Take a 1 1/2 tablespoons of the sushi rice and form into a rectangular block about 2-inches long with rounded edges and sides. Scoop up a tiny amount, about ¼ teaspoon, of wasabi paste with the tip of your finger and spread it on the inside of the shrimp. Place the shaped rice on top of the wasabi and press gently. Press into the shrimp, but make sure it holds its shape. Does it have to be uncooked shrimp? The shrimp is cooked for 3 minutes. This is one of the easier ways to make sushi. If you want to add some flavor and different texture wrap a thin slice of nori around the shrimp and rice. Yummy. Oh and the the soy! So mouth tingling! Way to go! Average rating of 4.50 stars based on 4 reviews. 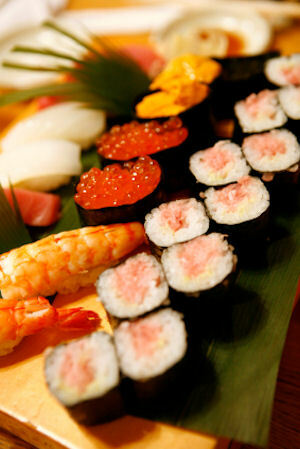 Summary: Not all sushi recipes use raw seafood, and this dish calls for cooked shrimp. This is a great beginner sushi for kids and those not interested in eating raw fish.